The other day I wrote a love letter to my slow cooker, and ever since people have been asking me about the meal I mentioned at the end. Now that I’ve finally tasted this AWESOME dish, I realized it is, in fact, too good not to share! This really indulged the Italian side of me. Sausage and Peppers is a family favorite and something I grew up eating– especially cooked by my very talented grandfather. While this is not the same, it definitely had some tasty similarities. And the balsamic vinegar— oh honey, don’t even get me started. I think I’ll be making this for my brother and sister-in-law labor day weekend– ITS THAT GOOD. I was originally inspired by a recipe on PopularPaleo.com and tweaked it a bit. The result was something so fantastic, my husband barely bat an eye at the fact that we were eating spaghetti squash. 1. Lay chicken on bottom of crock pot. Divide seasonings in half (with the exception of pepper) and toss on top of chicken. Then drizzle or spray olive oil. 2. Top chicken with raw onion, garlic and frozen bag of veggies. Then lay the sausage on top. 3. Cover everything with all three cans of tomatoes, the chicken stock, and balsamic vinegar. Then finish it off with the last of the seasonings. 4. Cook in slow cooker on high for 5 hours or low for 7. 6. 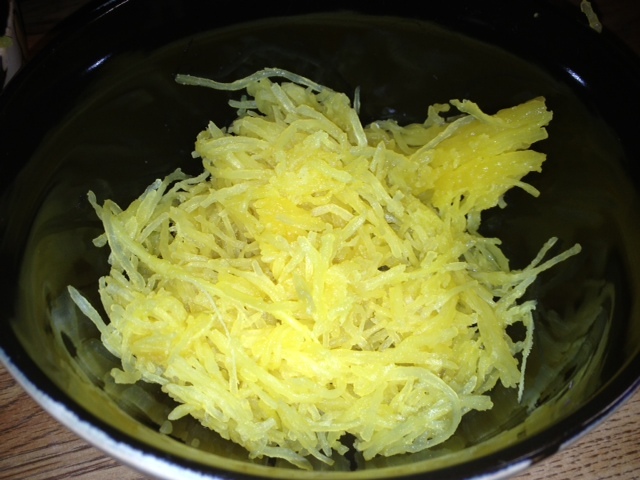 Place portion of spaghetti squash in bowl and mix with your crock pot creation. Enjoy! I keep telling myself that I am going to cook with spaghetti squash, but never do. This inspires me! It’s a magical food, let me tell you. I’ll admit I like zucchini pasta most web it comes to veggie alternatives. But spaghetti squash is an amazing addition to meals like these. It’s great for casseroles too!